Hunt the Devil is the joint project of Robert L. Ivie and Oscar Giner. The blog is based on our book, Hunt the Devil: A Demonology of US War Culture (Tuscaloosa: University of Alabama Press, 2015). The blog, Hunt the Devil, critiques U.S war culture from a mythic perspective. It examines common myths that comprise the demonology of war and recovers American myths for disrupting the mindset of armed conflict. The goal is to demilitarize the vision and the story of democracy. 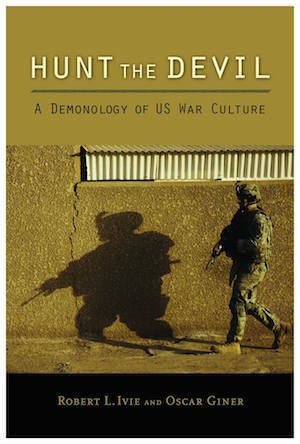 The book, Hunt the Devil, is a critical genealogy of demonizing imagery embedded and codified in U.S. war culture. It examines the operation of what we term the devil myth in its past and present iterations and employs the trickster myth to show how demonizing rituals have been disrupted from time to time. The purpose of our study is to denature a mindset that promotes militarism and undermines democracy. To unveil the devil myth, the book identifies outward projections of evil onto the faces of America’s enemies. It begins by scrutinizing the image of evildoers used to justify a global war on terror. It is difficult, we observe, to recognize this literalized image as a rhetorical construction subject to critical reflection without revisiting earlier manifestations of the devil myth in American history. Mythical projection is a cyclical process of political culture. Traces of earlier iterations of the devil myth carry into the present, but enemies are demonized anew in distinctive ways at each historical juncture of national crisis. To illustrate this process, we include chapters on the demonizing terms of various crises preceding the war on terror: witches, Indians, dictators, and reds. Each chapter shows how these emotionally loaded symbols have functioned as apparitions of dark foes, the destruction of which is required to redeem the nation’s innocence. In this way, we reveal how the subliminal figure of the devil haunts U.S. political culture so that war symbolically wards off evil in defense of the nation, but at the cost of curtailing its democratic soul. One of the book’s underlying questions is how the nation can make peace with diversity instead of condemning it as a dark foe carrying the mark of evil. We work toward an answer by discussing the creative and critical role of the democratic trickster. Robert L. Ivie is Professor Emeritus of American Studies & Communication and Culture at Indiana University, Bloomington. Oscar Giner is Professor of Theatre in the School of Film, Dance, and Theatre and Film Advisor in the Barrett Honors College at Arizona State University, Tempe. Bravo Robert and Oscar! The demonology of American history finally gets turned back on itself.